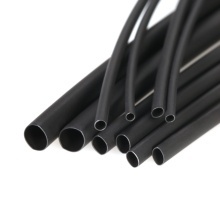 The heat shrink tubing performs environment friendly, quick shrink and stable performance. Halogen free, non-smoke, non-toxic & flame retardant. Shrinkage ratio is 2:1, will shrink to 1/2 of its supplied diameter. Suitable for electrical insulation, wire bundling, mechanical protection, wire/cable joints and daily repairs, etc. 10mm, 14mm, 20mm, 25mm & 50mm are supplied flat, the diameter is still the same as stated in listing.